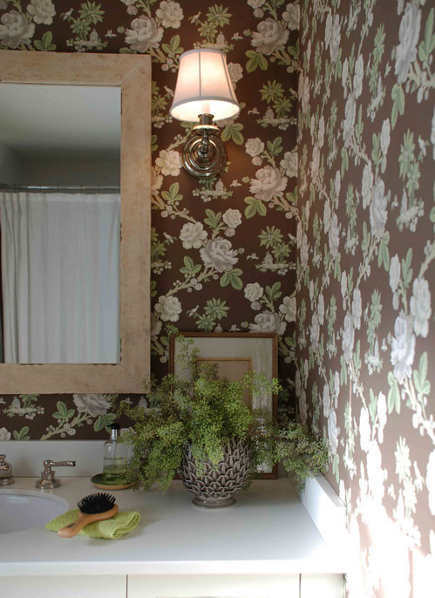 These five wallpaper styles are helpful categories to understand when choosing paper for a room. Just like fabric, wallpaper styles vary greatly according to pattern, scale (relative size of the pattern), overall look, predominant color and theme. And you see every single aspect when it goes up on the wall — plus there are often secondary and tertiary elements. With such a wide range it’s sometimes tricky to categorize wallpaper and manufacturer’s collections aren’t always clear either. Here are five basic wallpaper styles (though certainly there are more) which offer a starting point for thinking about paper for a room. This can cover a great deal of ground. 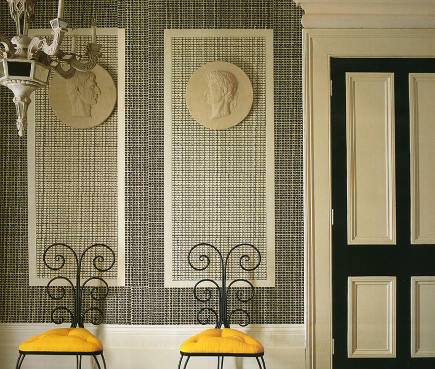 A small-scale geometric paper, like the Fez II from Quadrille Fabrics [top], has a 2-inch pattern repeat, making it look modern, dense and textural – almost like tile on the wall. An abstract with curvilinear elements – like this gold on green arabesque paper – is open and lets the background color show through. The complexity of line creates a play of shapes within shapes and in the medium-size pattern helps expand a small space. 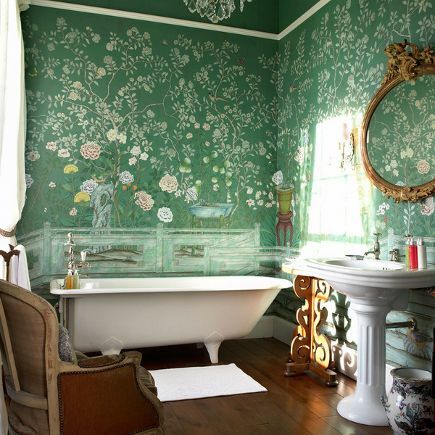 In general, toile patterns are set outdoors. At their most traditional, they depict bucolic pastoral scenes. 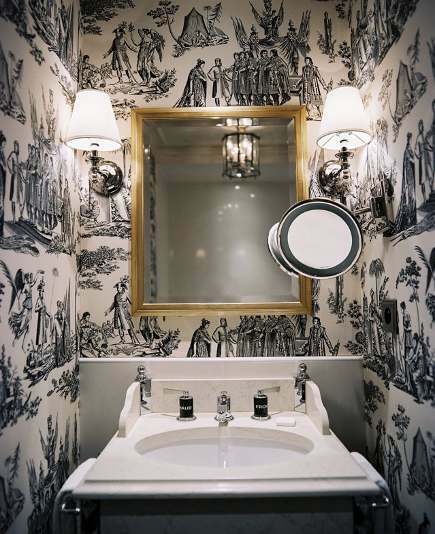 This black and white Neoclassical toile advances that, depicting scenes from a Napoleonic military campaign that include the emperor himself. The way this one repeats almost gives the impression of a wrap-around panorama though the mirror covering the scene smack over the sink kills the paper as a focal point. Peasant figures outlined in leafy frames are staggered vertically on this very traditional Provincial style wallpaper in subdued earth tones. 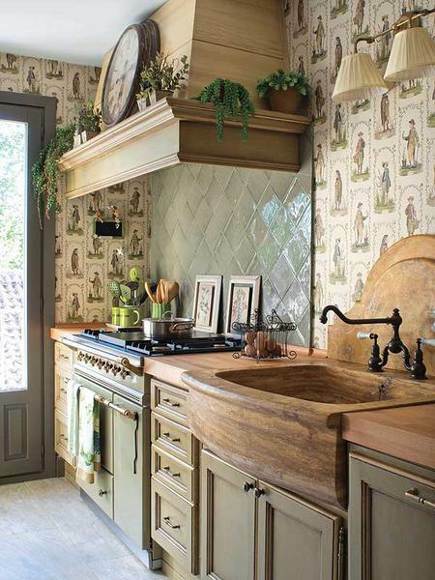 For this rustic kitchen with so many surface elements in addition to a diagonal tile range guard, it could be said that the wallpaper pattern competes with other kitchen surfaces. But wallpaper is rarely used in kitchens today so let’s call it a matter of taste. These super traditional (and often historic) papers often have a horizon line and a variety of landscape and floral elements, particularly when there is a Chinoiserie theme. Chrysanthemums (good luck) are depicted in this Temple Newsam design in standard design colors on custom blue-green Williamsburg background from the granddaddy of scene paper sources – Degournay. There are modern scenics but this bathroom in Balfour Castle, Scotland, shows the grand effect this type of 18th Century paper provides. The bamboo motif of the Chinese trellis pattern paper (from China Seas) creates its own architecture on a wall. 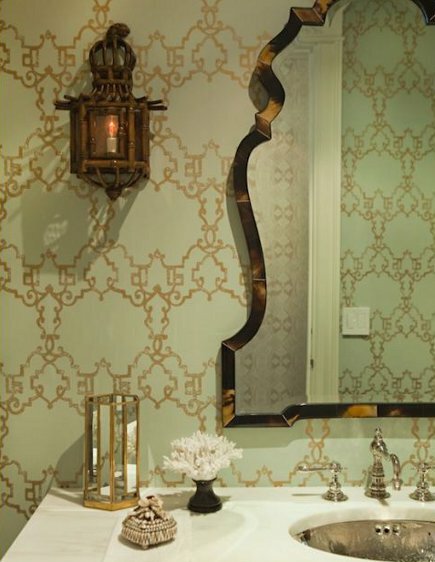 The bold, large scale paper is unforgettable and the white-on-brown colorway is a favorite of designer Tom Scheerer who used it in this Florida bathroom (the background also comes in turquoise, tangerine, blue and beige). A Victorian-bamboo dressing table with integral mirror works perfectly as a structure for a marble-top sink and reinforces the look. There seems to be an infinite variety of flora, fauna and animals rendered in thousands of different style and colors. The large scale of the botanical paper and the way it undulates on the wall, provides a definite sense of movement – as if a wind was gently blowing down the hall. White roses are nearly synonymous with floral wallpaper and even with the chocolate brown background this pattern looks as if it could be straight out of an early 20th century costume drama. For a gentle, totally conventional room with a feminine vibe, climbing roses are perennial. 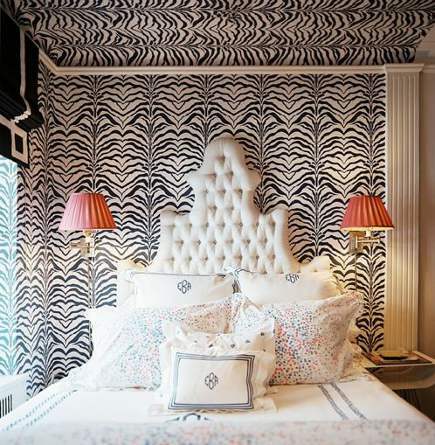 Always intense and adventurous, zebra pattern wallpaper has been seen on the blogs for some time. Like leopard print, it’s an animal theme staple which offers the bonus of an abstract look plus an intense pattern, particularly when used on a ceiling in addition to walls. Now imagine how much less visual buzz there would be in this bedroom with black-painted walls and a white ceiling.